Proportion of patients with confirmed PE can be expected to be around 12% in this group. Low risk of pulmonary embolism. Proportion of patients with confirmed PE can be expected to be around 10% in this group. How to use our PE calculator? What are Wells criteria? Wells score calculator for pulmonary embolism will tell you how likely it is your patient is undergoing a pulmonary embolism episode, based on a list of clinical features. In the text attached to our pulmonary embolism calculator (PE calculator), you will find an answer to the question: "What is a pulmonary embolism?" as well as many other useful pieces of information on PE. Apart from the pulmonary embolism definition, you will learn about the creation of Wells criteria and its clinical interpretation. Finally, we will teach you how and when to use our Wells score calculator, step by step, based on pulmonary embolism symptoms. Such a blockage results in the increase in pulmonary arterial pressure and increased right ventricle overload. It means that the right ventricle has to overcome more significant resistance and, in such conditions, it becomes insufficient very quickly. In fact, right ventricular failure is thought to be the primary cause of death in pulmonary embolism. A decrease in the output of right ventricle leads to less blood entering and leaving the left ventricle. It leads to a decrease of systemic blood pressure and lower perfusion of organs, including the heart itself. Cardiomyocytes (contractible cells compromising cardiac muscles) receive less oxygen and their performance becomes poorer. They may even die which results in myocardial infarction, also known as a heart attack. Check out our other calculators helping you determine the state of the heart and blood pressure of a patient. Stroke volume calculator will tell you what volume of blood the heart pumps with each stroke, while the MAP calculator will let you calculate mean arterial pressure (especially useful for patients in shock). Dyspnea (shortness of breath) – a subjective sensation of having difficulty while breathing. Pleuritic chest pain – chest pain that intensifies during inhaling and exhaling. Substernal chest pain – may imitate cardiac angina. It can be misleading during the diagnostic process. Haemoptysis – coughing up blood. It is one of the Wells criteria. Note that it is present only in around 8% of patients with pulmonary embolism. Other signs of pulmonary embolism: hypotension, shock – these require immediate medical attention. Pulmonary embolism is often accompanied by deep vein thrombosis, which symptoms (unilateral leg pain and extremity swelling) are also a Wells criterium. In the study “Excluding pulmonary embolism at the bedside without diagnostic imaging: management of patients with suspected pulmonary embolism presenting to the emergency department by using a simple clinical model and d-dimer.” published in 2001, Doctor Phil Wells, along with his colleagues, proposed a system of clinical criteria enabling the assessment of probability of pulmonary embolism. This system puts patients into specific PE risk groups before even performing advanced biochemical and imaging diagnostic tests. The ability to assess the patient right at his/her bedside is one of Wells criteria main advantages, thanks to the fact that it uses only clinical parameters. Knowing the likelihood of PE allows a clinician to decide, whether the patient should directly undergo imaging tests or if D-dimer level should be measured first. Signs of pulmonary embolism are very unspecific (see Pulmonary embolism symptoms paragraph), so every additional piece of information helps when conducting a successful diagnostic process. First, use our Wells score calculator if you suspect that the patient may have a pulmonary embolism. The patient also needs to be hemodynamically stable. Secondly, check for clinical signs and symptoms of deep vein thrombosis. These are the pain in deep vein localization (most often in calves) and leg swelling. You can quantify this second parameter by measuring leg size and comparing it with the other one. If the patient has clinical signs of DVT, they receive 3 points in the Wells criteria system. Go back to the paragraph what is a pulmonary embolism? – pulmonary embolism definition to learn why this feature is so associated with PE. Thirdly, measure the patient's heart rate. You can do it by auscultating the heart, palpating the pulse (e.g., on radial artery) or checking their bedside ECG. It is better to combine multiple methods. If the patient's heart rate is over 100 beats per minute, they receives an additional 1.5 points in the Wells criteria system. We have a smart tool that will help you calculate a patient’s heart rate based on the number of boxes in RR interval in the ECG. If you are interested, go our ECG heart rate calculator. Next, check whether the patient has had surgery in the last four weeks OR was immobilized during the previous three days. If going to the bathroom are the only times when the patient got out of bed, they are still classified as immobilized. Surgery and immobilization in the recent past adds another 1.5 points to the Wells score. Now, check the patient's history for previous objectively diagnosed episodes of deep vein thrombosis or pulmonary embolism. If there are any, the patient will get an additional 1.5 points. See whether the patient is coughing up blood, a symptom known as haemoptysis. Note, that this is not specific only to pulmonary embolism; many diseases of the lung or other organs may result in hemoptysis. Nevertheless, its presence results in 1 point on the Wells criteria system. Verify whether your patient is undergoing cancer treatment OR their treatment for cancer was terminated in the last six months, OR is receiving palliative care due to their cancer. If any of these conditions is true, the patient gets 1 point on the Wells criteria system. Finally, answer the question whether, in your opinion, pulmonary embolism is the most likely cause of patient's symptoms, OR pulmonary embolism is on par with an alternative diagnosis as a cause of patient's symptoms. Many clinicians criticize this criterium because of its subjectivity. A system intended to objectify clinical findings has a thoroughly subjective criterium. The answer to this criterium may be based only on physicians experience. It is worth 3 points in the Wells criteria system. Our Wells score calculator will sum up the points from all of your answers and provide you with the correct classification of your patient's risk group. For more information, go to the next paragraph. There are two ways of dividing patients into PE risk groups based on their Well score. 0 – 1 point – low risk of pulmonary embolism. The proportion of patients with confirmed PE can be expected to be around 10% in this group*. 2 – 6 points - moderate risk of pulmonary embolism, with an expected proportion of 30% of patients with confirmed PE. 7 and more points – high risk of pulmonary embolism, with an expected proportion of 65% of patients with confirmed PE. 0 – 4 points - pulmonary embolism unlikely group. The proportion of patients with confirmed PE can be expected to be around 12% in this group*. 5 and more points – pulmonary embolism likely group, with an expected 50% of patients with confirmed PE. Nowadays, this classification seems to be of more clinical significance. It is recommended that the patients with Wells score of 5 points and more, directly undergo imaging tests (the best is the computed tomography pulmonary angiography – CTPA), while patients with lower Wells scores should be tested for their D-dimer level. This test has a very high negative predictive value. It means that a low level of D-dimer (negative result of the test) credibly excludes pulmonary embolism. Because of that, patients do not need to undergo other more invasive diagnostics that may have a negative effect on their health. Did you know that sleep deprivation increases an overall mortality risk? Check if your sleep pattern is healthy with our sleep calculator. *Percentage values based on results of review including 29 studies with 31215 patients. 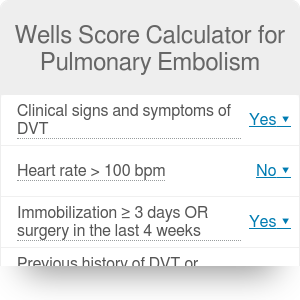 Wells Score Calculator for Pulmonary Embolism can be embedded on your website to enrich the content you wrote and make it easier for your visitors to understand your message.